Here at 2600Hz, almost all of our clients run heterogeneous infrastructures, which means we have to handle many different manufacturers so we couldn’t use the proprietary solution. In addition, we work with a lot of handsets and we realized pretty early on that manual provisioning wouldn’t work for us. If everything is matching, the phone will begin the update process. Once complete it will enter service. This process has to work every time for every handset. Now, you might think that after 150 years of telecom, there might be some standardization between vendors. However, that’s certainly not the case with respect to provisioning. Every manufacturer has a different way of crafting their provisioning files, from the number required to boot up a phone to the names of the files. Now there’s even more added complexity with companies acquiring each other, like Polycom’s acquisition of Obihai. 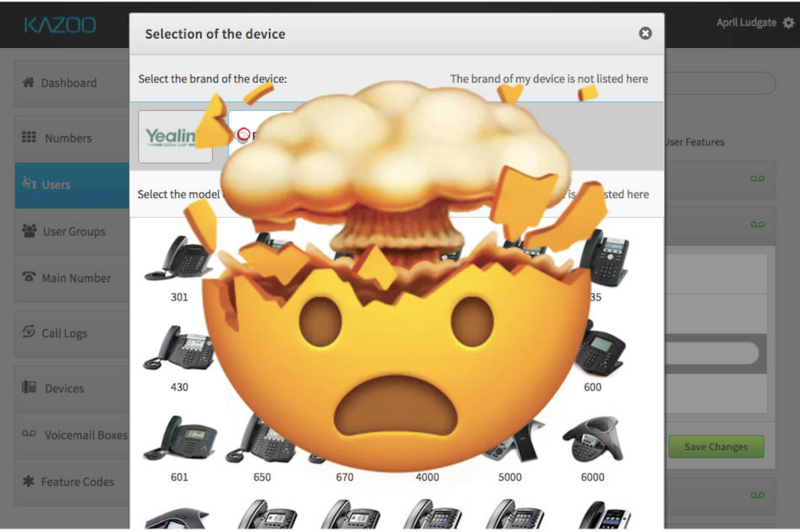 In this instance, Polycom rebrands Obihai devices under the Polycom name, but the config files remain in the Obihai template rather than changing to use the Polycom template. It’s enough to drive a developer batty, but this is what we have to work with. Seriously, go look at the Polycom firmware grid - it’s like a forest of incompatible firmwares! If you want to present your users with simple-to-consume services, you must first conceal complexity. That’s a recurring theme in all the work we do at 2600Hz, but it’s perhaps no more true than what we’re doing with respect to provisioning. You’ll notice that we request a user to select the brand and model of their phone, a name, and a MAC address. The only piece of specialized information is the MAC address; everything else is immediately obvious to the user. But provisioning the handset doesn’t govern how the handset might interact with the network. That’s why we’ve included some extra features to take the experience just a bit further, such as segregating combo keys and device restrictions from the main UI, while still giving you access to them in Advanced Settings and Advanced Provisioner application. With Advanced Provisioner, users can now go even deeper in the functionality of their devices in a cleaner and more intuitive UI. Available for specific brands, including Polycom and Yealink, you can take customization a step further than the UI offers. For example, you can create templates for combo keys to be disseminated to multiple devices at once to save time and effort, and eliminate unnecessary troubleshooting. Here you can see the Combo Keys section in Advanced Settings. Our main application, SmartPBX, keeps the complexities of setting up an office to a minimum by exposing the essential business features and separating advanced functionality into individual applications. 2600Hz has built an awesome suite of provisioning tools for our clients to help them manage their systems. Provisioning is hard because hardware manufacturers make it hard, but that’s why there was an opportunity for us to innovate in the first place. By concealing complexity from our clients, we make everything run smoother and in a much more controllable fashion. To learn more about 2600Hz and how we can help simplify your life and business reach out to us with an email to sales@2600Hz.com.